The timeless appeal and enduring charm of traditional bathrooms means they are as popular today as they have ever been. Perfect for older properties; a traditional bathroom will help you to retain the authenticity and character of your home. What's great about the traditional style is that you can either choose to incorporate lots of traditional elements in your bathroom or instead combine your favourite traditional and contemporary bathroom fixtures together. There are so many beautiful traditional bathroom fixtures and fittings to choose from you will find it hard not to fall for the charm of a traditional bathroom. In this expert guide from online bathrooms specialist Victorian Plumbing we share our favourite traditional bathroom ideas. We take a closer look at the individual features of traditional bathroom designs and mix it up a little by adding a few modern traditional bathroom ideas too. 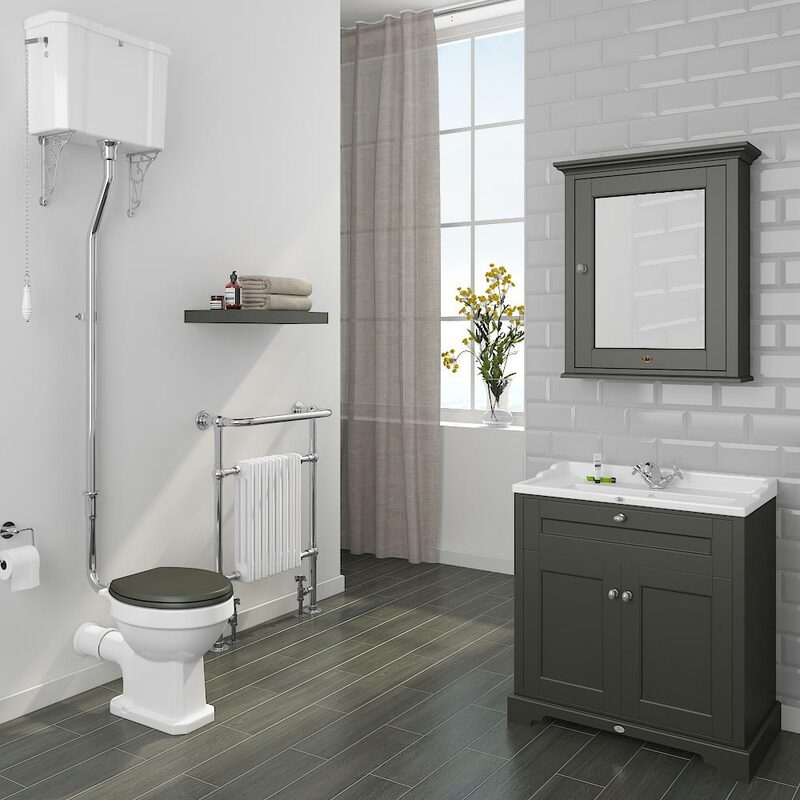 A great starting point when planning a traditional bathroom is to take a look at our selection of traditional bathroom suites. 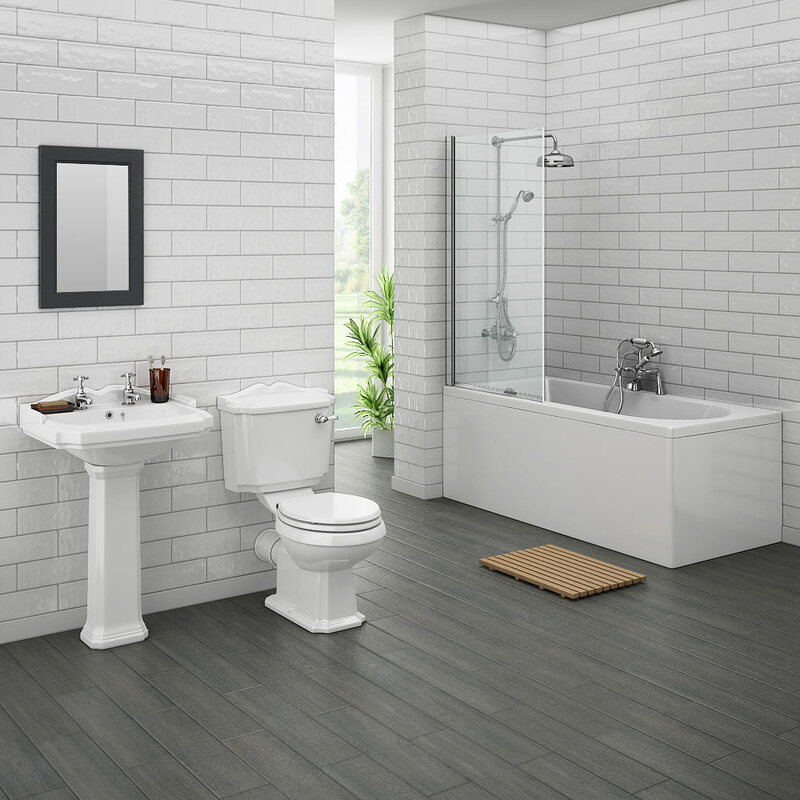 A traditional suite will typically consist of a toilet, a basin and a bath. For smaller bathrooms; traditional cloakroom suites include a toilet and basin set. Traditional toilets typically come in either the compact close-coupled style (with the cistern right above the pan) or you can choose a high level toilet where the cistern is positioned on the wall above the toilet and held in place by ornate supporting brackets. Traditional basins are available in the ceramic pedestal style, as a vanity unit (where the basin is fitted into the top of a storage cupboard) or as a console basin that has a ceramic pan on top of a chrome console frame. Traditional baths can either be in the standard rectangular style or as a freestanding bath that sits on four supporting legs. 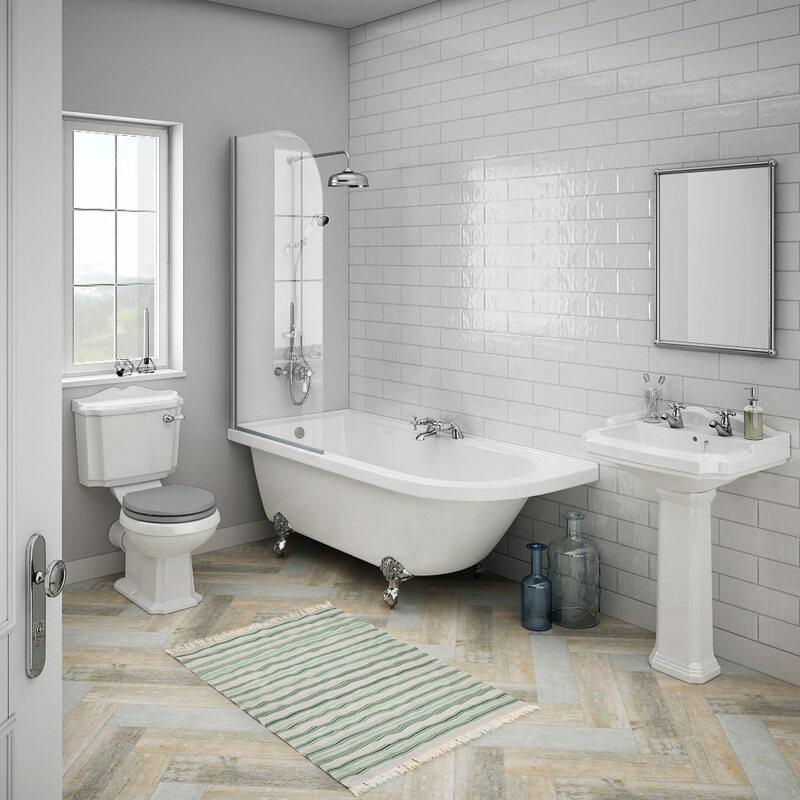 Choosing a traditional bathroom suite is a clever way of making sure that the main fixtures in your bathroom all match up because bathroom suites are carefully chosen to make sure each element complements each other. Freestanding baths are one of the standout features in any traditional bathroom design; if space permits, we strongly recommend adding one to your new bathroom. Traditional freestanding baths are available in a good selection of eye catching designs so our advice when choosing one is to take your time and pick out a bath that matches the style of your bathroom and home. A single ended freestanding bath, for example, is designed so the taps are positioned at one end of the bath whereas double ended freestanding baths are arranged to have the taps sat in the middle. A slipper style freestanding bath has one or both sides of the bath raised up (like a slipper). Slipper style baths can have the taps positioned either at the end or in the middle of the bath. 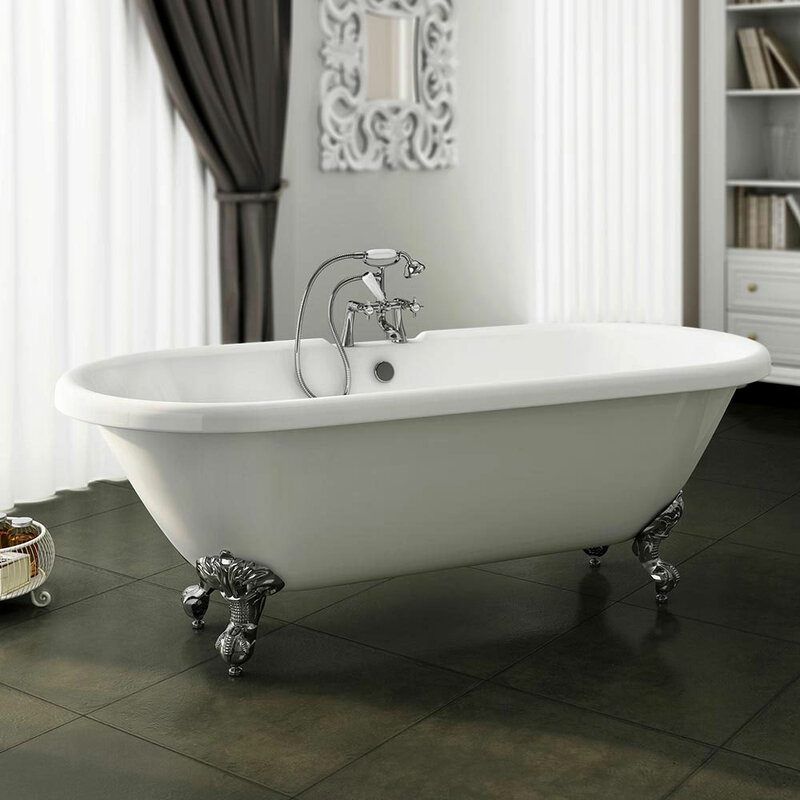 The other option to consider when buying a traditional freestanding bath is what colour would you like? White is still the most popular bath colour however in recent times the popularity of painted freestanding baths has been on the rise. These visually stunning painted designs are available in a multitude of colours that include grey, blue and even black. Traditional bathroom furniture is a beautiful way of adding a graceful authenticity to your bathroom design. Traditional furniture pieces are all about attention to detail and quality materials. Traditional cabinets (referred to on our website as vanity units) in particular have become really popular, the universal nature of their style has led to us seeing them being used more in modern bathroom designs. Two traditional bathroom furniture ranges that could be perfect for your new room are our Chatsworth and Downton Abbey collections. The Downton Abbey collection is exclusive to Victorian Plumbing and includes furniture pieces and traditional bathroom mirrors inspired by the world famous ITV television series. 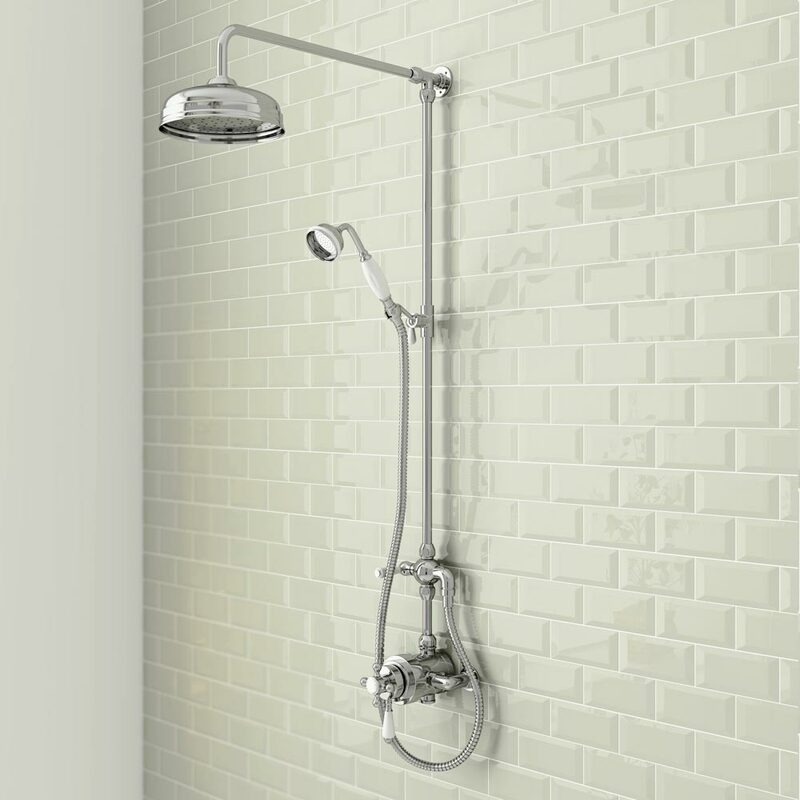 Traditional showers that match up well with a period bathroom include rigid shower sets with beautiful exposed valves and showers with concealed valves and a fixed shower head. Circular fixed shower heads really complement a traditional setting and apron shower heads in particular look beautiful. As mentioned above you can choose to buy a complete traditional shower (sold as a set) or the other option is to individually pick the parts of the shower yourself. Two traditional showers that have proven very popular with Victorian Plumbing customers are the Trafalgar exposed valve shower and the Astoria traditional shower set. Getting the tiles right is an important part of planning a traditional bathroom. 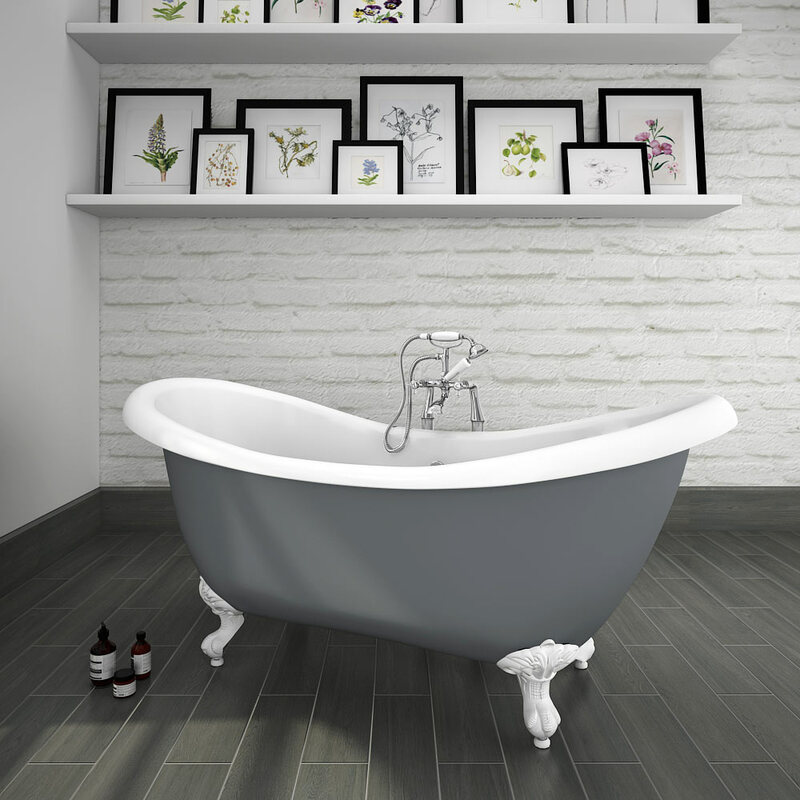 Patterned and wood effect floor tiles have proven extremely popular for traditional bathroom designs. Both light and dark wood effect tiles work well in a traditional space. 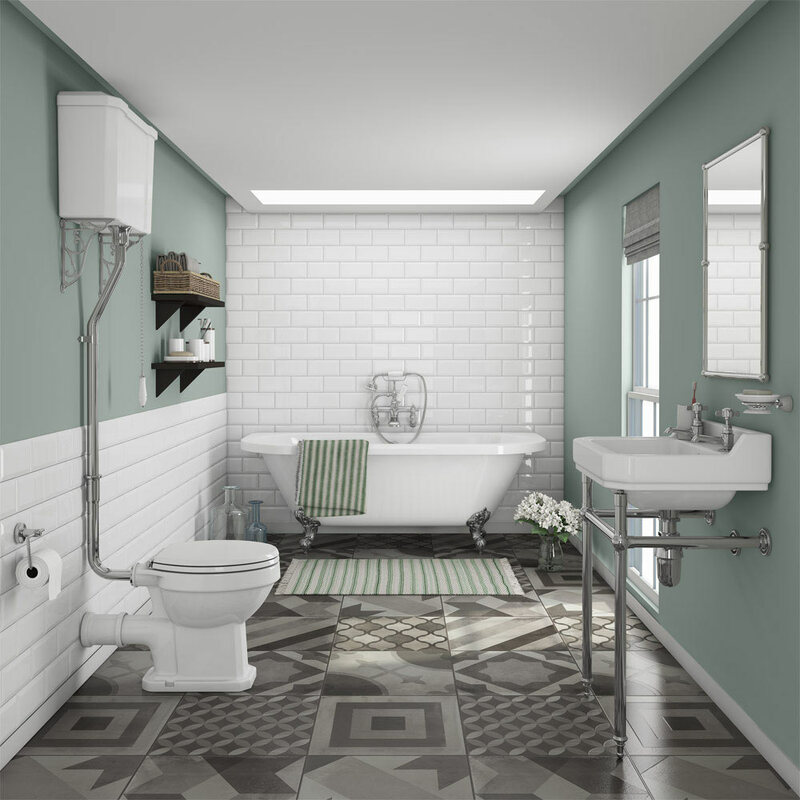 If you are planning for patterned tiles on your bathroom floor then rich Victorian patterns are a smart choice and if you're looking for a splash of colour then maybe opt for our Vibe light blue patterned tile. For the walls of your traditional bathroom you can't go wrong with metro tiles. The super glossy, rippled effect metro tiles are what everyone is making noises about right now and it just so happens we have two ranges that match this style called Mileto and Westbury. When it comes to traditional heating ideas you are spoilt for choice. Traditional heated towel rails are just perfect for a period room and what's great is that there is a large selection of styles and sizes available to suit any room size and shape. 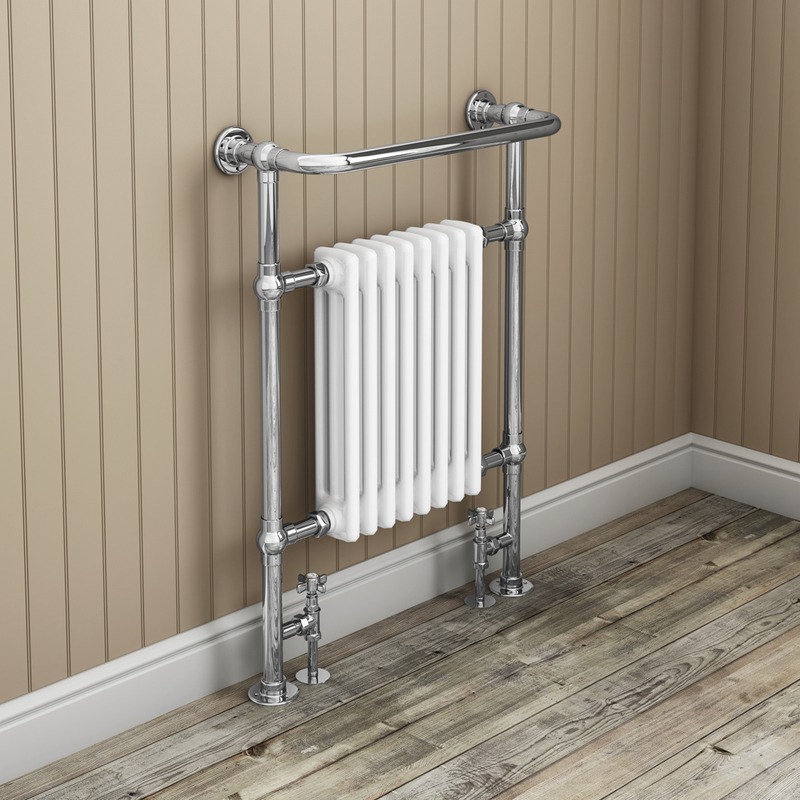 These beautiful traditional style radiators are available as simply the heated towel rail frame or as a combination of both frame and an integrated column radiator. One other bathroom heating solution that works with traditional spaces are cast iron radiators. These beautiful, ornate designs might require a little bit of investment, however if you choose a cast iron radiator your bathroom you will certainly have added an eye catching feature. There's a large selection of bathroom taps made specifically for traditional spaces on the market in the UK and plenty of these designs are more budget friendly than you might have thought. 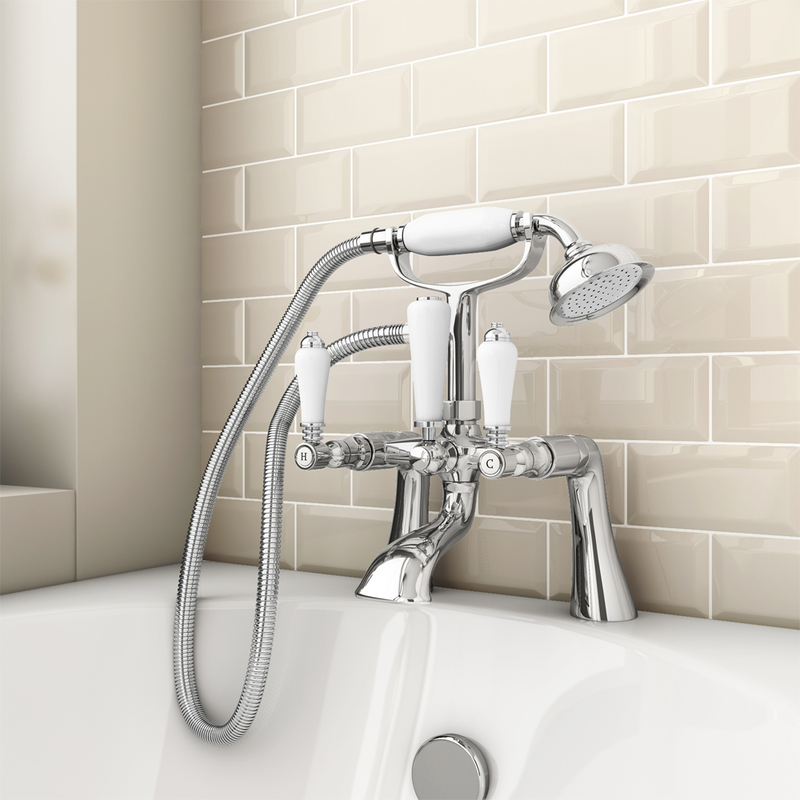 Cheap crosshead taps, for example, will complement any traditional bathroom and are a fantastic budget-friendly idea. Another popular option is a traditional mono bloc mixer tap that uses one tap hole and then mixes both your hot and cold water supplies together to help set the perfect water temperature. If you are planning on installing a traditional freestanding bath in your new room then when not opt for a traditional bath shower mixer tap, Sometimes lovingly referred to as the 'telephone tap', these gorgeous tap designs can be used to fill up your bath or or as a shower head. We really hope you have enjoyed reading our guide and picked up some useful traditional bathroom ideas. For further inspiration and more traditional bathroom images why not take a look at our traditional bathrooms board on Pinterest. Another fantastic source of inspiration is the Victorian Plumbing blog that's packed full of bathroom ideas. Thank you for reading and the best of luck with your traditional bathroom.